This Pineapple Chia Cleanse by Smart Pressed Juice couldn’t have shipped in at a better time…seriously! I’ve just gotten back from a shore-vacation, where I may or may not have consumed a quantity of White Claw Hard Seltzers and Skinny Girl Margaritas that is not too friendly for weight loss. Lousy, tired, and bloated was essentially how I was feeling once I got back home (and I was only gone 4 days, ugh). I don’t know about you, but to me, that is the ideal state of being to go on a cleanse. When I hear the word cleanse, I think of crazy juice drinks, starvation, and strange concoctions the internet told me Beyonce drank to lose 10lbs in 3 days. And while I don’t doubt some of them work (especially ones that require fasting), the majority of cleanses won’t help in the long run. Not only that, but without naming names, many cleanses have little to no nutritional value and are created with some questionable ingredients. I can honestly say for this reason I have never done a cleanse before – well, that is until 4 days ago. Let’s chat a bit about why I changed my mind and the benefits of Smart Pressed Juice Pineapple Chia Cleanse. For starters, I’d like to clarify that this article is based on my own experience with this cleanse, and the information Smart Pressed Juice provides for their product. I am in no way, shape, or form a dietary expert, just a gal trying to shed a few and be healthy. Additionally, it’s also important to note that I’ve only tried out their Pineapple Chia Cleanse by itself, and this review will solely be based on this specific product. However, if you’d like to really amplify the cleanse, I suggest checking out the other products they have in their cleansing lines. What really attracted me to Smart Pressed Juice Pineapple Chia Cleanse is their use of clean ingredients and incorporation of prebiotics and probiotics into their products. As I’ve touched on very briefly here on Lose it Lyss, ever since I began my weight loss journey, I’ve also been striving to make healthier decisions overall, not just cutting down a few calories and exercising. That means being more proactive about the foods and products I put in and on my body. I was surprised to discover just how many ingredients are packed into a single serving of this cleanse powder! One scoop (which is so kindly provided inside) contains “certified organic flax seed, certified organic chia seed, certified organic psyllium husk and certified organic fennel seed,” in addition to an even longer list of certified organic prebiotics, sprouts, enzymes & probiotics. I mean, woah!! You can check out the full list of goodness on their website under additional information. All of the above ingredients work to clean out our bodies and digestive systems in different ways, due to their abilities to reduce bloating (pineapple enzymes and probiotics) and pack a punch with fiber and proteins (sprouts blends, chia & flax seeds). Working together, they aid in releasing toxins from the body and support bowel functions (yep, I went there!!). While these benefits all sound great, how well does it *really* work? First, I’d like to mention that there is no set instruction or dietary “plan” as to how to use this product on their website or packaging (and when I say “plan,” I mean directions to fast, or take X times a day, etc…). Smart Pressed Juice does state that when taking this product as a standalone, it can be used as a “mini-cleanse,” which I chose to interpret as a once a day usage. This also to me just felt like the healthier option, as I’ve never been too keen on fasting and also have a fear of exploding from multiple uses daily (literally exploding….I went there again!!) 😉 As for actual preparation, the label suggests to mix 1 scoop in an 8-10oz glass of water or vegan milk. Since I didn’t have any vegan milk in at the time, I chose to go the water route on my first day…so quick and easy guys! The taste of pineapple was subtle and quite nice; however, the texture of the chia seeds mixed with water initially turned me off. While it was by no means bad, this was my least favorite method of consuming the Pineapple Chia Cleanse. I don’t doubt mixing it with water is something I could get used to in time; however, I’d much rather focus on ways to making this drink an 11/10. Also, if at first, you don’t succeed, try again! Day 2 I took a slightly different approach (unfortunately there still wasn’t any milk in). Rather than using plain water, I mixed one serving of the cleanse into a lemon-flavored sparkling water and guess what – it turned out much better! The bubbles helped combat the texture and the lemon added another level of flavor. If you give this cleanse a try and decide to go the water route, then I definitely recommend experimenting with sparkling waters. I decided to branch out even more and mix Pineapple Chia Cleanse in a smoothie because, quite frankly, I was craving one! One thing’s for sure, it’s like this product was made for smoothies. Safe to say this method was definitely my favorite out of the three, and if you decide the smoothie route is for you, then check out my Pineapple Chia Cleanse smoothie recipe below. Like I had mentioned before, I, unfortunately, suffered from a serious gain after my vacation (almost 5lbs) and even stumbled on staying within my points once I got back home. I mean, once you taste chocolate, it’s pretty dang hard to go back. Before giving this cleanse a go, I decided to weigh in even though it wasn’t my usual Weight Watchers weigh-in day…and I’m glad that I did! The day after I got back from my vacation (Wednesday) I weighed 218lbs, and when I completed my weigh in the following Sunday (post cleanse), I was back down to 213.2.lbs. WOW! While I do not want to give all of my credit to this cleanse (I was *somewhat* eating healthier, though still going roughly 5-10 Smart Points over my daily allotment) I do believe it aided my loss, especially in regards to shedding excess water weight. Not only did the results show on the scale, but it was remarkable how much I improved both physically and mentally. Once I began this daily mini cleanse, my swelling and bloating decreased drastically (hello rings fitting again!) and was overall much more energized. Again, while I do believe I naturally would have begun feeling better post-vacation regardless, this chia cleanse totally helped me bounce back faster. 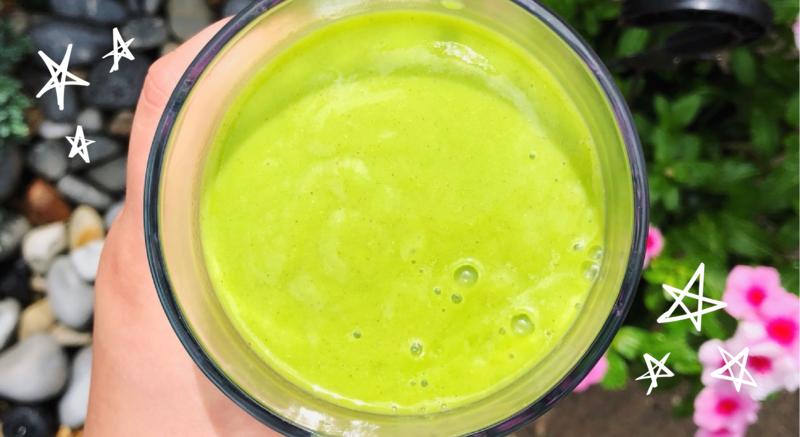 I am happy to say that this cleanse is one I intend to keep using a couple times a week or whenever I deem necessary – especially in smoothie form! Speaking of smoothies, keep reading to see how I make mine. In the end, while I don’t believe cleanses are the end all be all for weight loss and support it in the long run, I will say that some of the ones out there are gems and have nutritional benefits when practiced the right way. If you do decide to try out a cleanse, always be sure to do plenty of research on whatever product(s) you decide on trying. A huge thank you to Smart Pressed Juice for reaching out & sending me this Pineapple Chia Cleanse; all opinions in this review have been my own. Wishing you a happy and healthy week, & a fantastic Monday! Click HERE for my previous recipe for WW PHO!